The world is poorer place today without Aaron Swartz, an extraordinary hacker and activist who took his own life on Friday. It’s been a roller coaster of a few days as I and the people I know try to process this news, sadness and anger turning to grief and resolve. 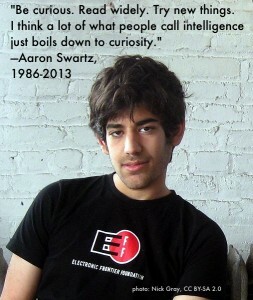 There have been many thoughtful tributes to Aaron, who in only 26 years inspired so many with his character and accomplishments: my colleague Peter Eckersley wrote the touching obituary on EFF’s site; Cory Doctorow, Larry Lessig, Quinn Norton, Jillian York, Rainey Reitman, James Grimmelman, Karl Fogel, Brewster Kahle, Rick Perlstein, Danny O’Brien, Tim Berners-Lee, and many more have written beautiful words that do as much as possible to sum up a truly extraordinary life. It’s a tragedy that he is gone, and another tragedy that we’ve lost the next 50 or so years of Aaron that we might have had. At 26 he had already committed a decade and a half to creating amazing work in the name of causes he supported. Any one of his accomplishments could provide the basis of an impressive obituary. The sheer breadth and depth of them speaks to the scale of his brilliance. That they should all belong to a young man only a year older than I am is incredibly humbling. One reason I’m so sad today is because Aaron stood so thoroughly for the cause of information freedom. I mean that in two senses: first, of course, he stood up for this endeavor, committing his life to improving the world in this arena. Through his software development, his speaking, his writing, and his life he pushed the ball forward, and we have made progress we would not have made without him. The battle against SOPA, to pick just one example, would have looked very different in his absence. But also, for so many, he stood for that cause in a more figurative sense. His fight was that fight, and he was to my mind inextricably linked with information freedom. He stood in for it, acting as a representative and an example. That’s a difficult mantle to bear, and I worry about the stress it would have caused him. I’ve read that he was having difficulty funding his legal defense but was terrified of asking for money, for example. I hope that wasn’t because he knew how much he meant to all of us. It’s not very productive, though, to try to get into the head of somebody who has decided to take his own life. I understand that his family (and Lessig and many others) think that at least some of the blame rests on the shoulders of an overly aggressive prosecuting attorney. Who can say? I will say this, though. The actions of the prosecuting attorney were completely out of line and disproportionate to any sense of justice. That was as true last week as it is today. Whether or not the ridiculous charges are responsible for his death, they were responsible for destroying his life. That is enough. It is time to take the energy of anger and of grief and channel it into productive outlets. First and foremost, in tribute to an extraordinary life, should be an effort to rectify the extraordinary injustices he fought. That means copyright reform, improving open access to information, and bringing the penalties for computer crimes into the realm of sanity. This is a long struggle, and it will mean changing the way people look at the world. I’m saddened to see people still saying Aaron “returned” the files he downloaded from JSTOR. That construction can only underpin the theft metaphor that the prosecution depended on. JSTOR never had anything taken from them. It’s not just nonsensical to say there was something to return, it’s a misconception that contributes to the injustice he faced. Aaron committed his life to this fight, and if he were still with us he would continue it today. Few people are so brilliant, so talented, and so driven to do what is right as he was. None of us can finish his work, but maybe all of us can.